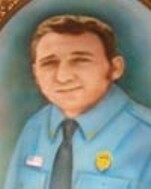 Herbert D. Johnson, Patrolman, Died December 7, 1977, in the Line of Duty. This portrait has been on display at Bogart City Hall since shortly after his death. Herbert Johnson’s death is memorialized on “Officer Down Memorial Page"- www.odmp.org/officer/7167. 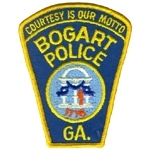 The Bogart Community plans to Honor Patrolman Johnson, who died in the line of duty on December 7, 1977. A granite monument honoring his memory will be dedicated on Sunday December 9th at 3 p.m. in front of the Bogart City Hall. Herbert Johnson was struck by an inebriated driver while working traffic on Highway 29 in Bogart. Organizations sponsoring the monument and dedication are: Bogart Historical Society • Bogart Women’s Club • Bogart Jr. Women’s Club • Bogart City Hall. Herbert Johnson grew up in Bogart attending school with Janet Zuber Luke and others of the Bogart High School. Herbert was in the Class of 1956. Herbert was survived by his wife, Marion Johnson, sons- Danny, Joel, Jesse (Danny was about 16 and Joel and Jesse were small boys)-and a brother, Mike, who lives in Bogart. 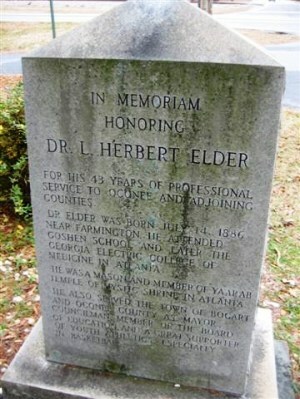 Herbert was named after Dr. Elder, long-time physician and institution of Bogart, GA. Herbert worked at Walt Crow’s Store on Highway 29 prior to being a policeman. Herbert Johnson was a volunteer fireman and was very involved in community activities. Herbert Johnson’s death was major news in the region in December 1977. Herbert had gone on duty after hours to help a tow truck move a car from the highway. He was struck by an automobile driven by a woman from an adjacent county who was headed home from a dinner with friends on Baxter Street in Athens. She said she did not see Officer Johnson in the dark – close to 11.o’clock. Patrol car and tow truck lights were flashing according to the accident report. The Officer was dragged considerable distance. The driver left the scene and her husband later reported the incident and she turned herself in a couple of days.She had some alcoholic drinks in Athens. The subsequent plea by the driver was attended by many people, including Herbert’s widow, Marion Johnson. I also attended court on that very sad day. She was very contrite at the sentencing. The driver was sentenced to one year confinement and five years probation. I assisted Herbert’s widow, Marion Johnson, with his estate. She was grief stricken and very sad. Mrs. Johnson loaned some death benefit funds to the Bogart Recreation Committee to buy additional land for the Bogart Recreation area. Marion Johnson died in 1992, reportedly in an automobile accident. 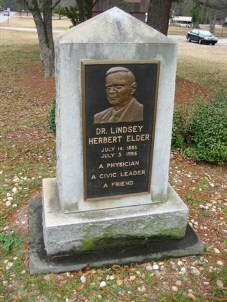 Friends of Herbert Johnson and the Johnson family helped initiate the recognition and funding for the granite monument. His tragic loss is still felt by many of his contemporaries.